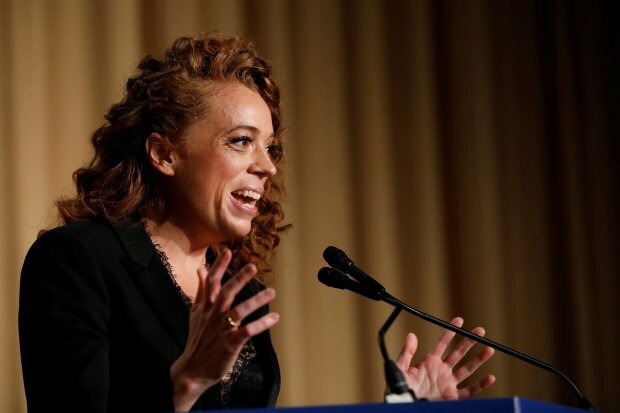 Comedian Michelle Wolf performs at the White House Correspondents' Association dinner in Washington, April 28, 2018. The anti-Trump comic gave the media what she thought they wanted. The Beltway media brigades held their annual night of industry awards and partying on Saturday, but this year’s event is notable for triggering some buyer’s remorse. 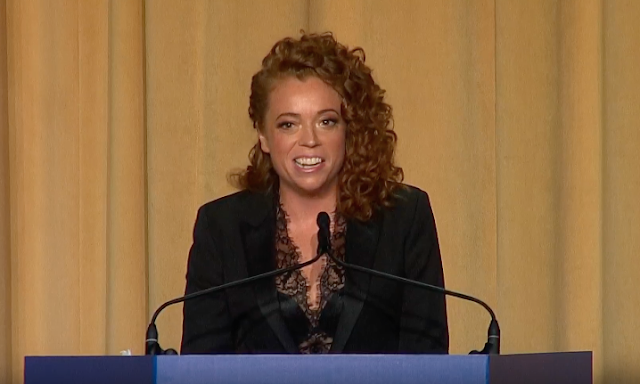 The White House Correspondents’ Association typically hires a comedian as entertainment. This year it was Michelle Wolf, formerly of Comedy Central. Ms. Wolf unleashed such a torrent of nasty gibes and vulgar jokes about Republicans and Donald Trump that even the anti-Republican, anti-Trump crowd had second thoughts. 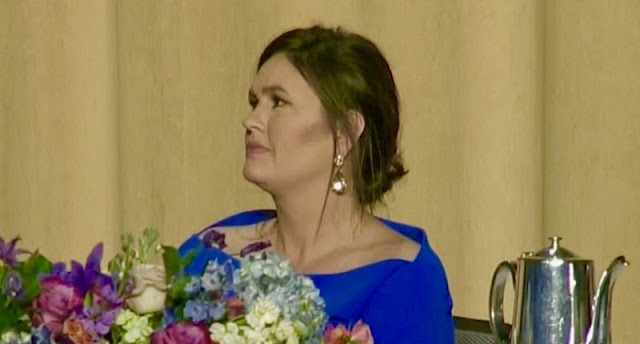 Peter Funt describes nearby some of the unfunny bits, and Ms. Wolf was especially vicious to White House press secretary Sarah Huckabee Sanders, who was seated on the dais. In an act of remarkable discipline, Ms. Sanders listened in stoic silence without walking out. The performance had media elites professing shock at Ms. Wolf’s excesses. “Media hands Trump big, embarrassing win,” wrote Mike Allen, whose morning newsletter broadcasts the conventional Washington wisdom. There were many similar sentiments on Twitter . Yet what did they expect? 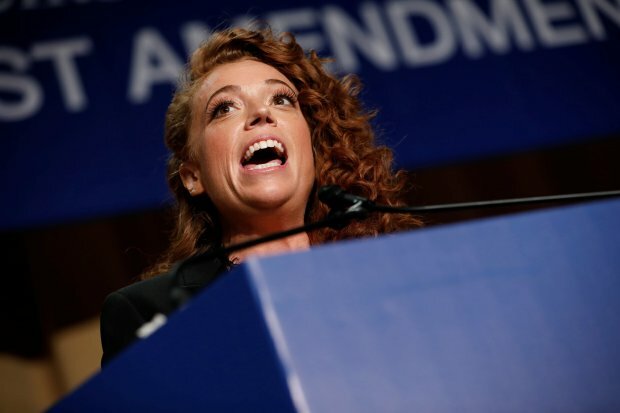 Michelle Wolf merely gave them what she no doubt assumed, with ample reason, the correspondents wanted. She comes from a network and recent style of comedy that specialize in attacking the politics and values of half the country. Much—not all—of the press corps has responded to Donald Trump’s surprising victory not by trying to understand it, much less report on it with any balance. Instead they have treated it like an alien invasion that must be repelled, and anyone associated with it as deserving disdain, ridicule or worse. Any reporter who doesn’t follow this herd of contempt is expelled from polite media company. Ms. Wolf was merely putting a cruder face on what she reads every day. All of which plays into the hands of Mr. Trump, who didn’t attend the event but did indulge in some Twitter gloating afterward. On a trip to Michigan on Saturday night, Mr. Trump also rolled out his typical and nasty attack lines about the press. If reporters want to know why millions of Americans believe him, look in the mirror of Saturday night. Comedian Michelle Wolf at the White House Correspondents' Association dinner in Washington, April 28. Consider his comments to a New York bookstore audience. That depends on who “us” is and whose “values” are being pushed. In a vacuum, the notion of seasoned professionals making the government run is unremarkable. But against the backdrop of continuing revelations of serious misconduct in those agencies during the Obama administration, there is no comfort for the millions of Americans who believe insiders abused their powers for partisan purposes. They see the “deep state” as a sinister force aiming to hijack an election and, when that didn’t work, undermine a fairly elected president. They also see a system with one set of laws for those favored by the government and a different set for everyone else. Comey, as an ambitious insider, was both a beneficiary and a perpetrator of this double standard of justice. He continues to insist that his investigation of Hillary Clinton was clean, even as he says he didn’t trust the actions of his boss, Attorney General Loretta Lynch. He insists the Trump probe was not affected by the anti-Trump sentiments of top officials Peter Strzok and Lisa Page, who texted about an “insurance plan” in case Trump won, or the lies to investigators of his top deputy, Andrew McCabe. His claim that he saw no bias is laughable — they were all biased in the same way, agreeing that Trump should not be president! In a truly bizarre claim, Comey said on Fox he isn’t certain the Russian dossier was paid for by Clinton and the Democratic Party. That doesn’t pass the smell test, and, even if true, would mean the probe was incompetent. The political motivation behind the dossier is a key fact when judging its credibility, as are the openly-partisan leanings of investigators. Yet to hear Comey talk, none of this matters. All that matters is that we should trust him to do the right thing, which happens to be whatever he says it is. That includes giving a “friend” memos he wrote to leak them to the media. Oops — it’s not a leak when he does it. Nor does he see anything wrong in writing a scathing book based on his private meetings with the president, even though he leaves an unprecedented stain on the FBI. Comey’s self-aggrandizement is apparent with his claim that he tried to “protect the independence” of the agency, as if it were a separate branch of government, accountable to no one. It also doesn’t seem to bother him that public trust is destroyed when law enforcement is politicized to help the candidate of the incumbent party and hurt the candidate of the opposition party. What happened at the FBI under Comey in 2016 was not “ballast.” It was a clear and present danger to America. This is the “deep state” in reality, not the idealized one he depicts. A final example involves how the most salacious aspects of the Russian dossier were published. Comey writes that he briefed President-elect Trump on the alleged prostitute saga, telling him that “media like CNN had the dossier and were looking for a news hook” to publish it. Presto — two days after that briefing, CNN broke the news that Comey had discussed the dossier with Trump, making the meeting the news hook CNN sought. 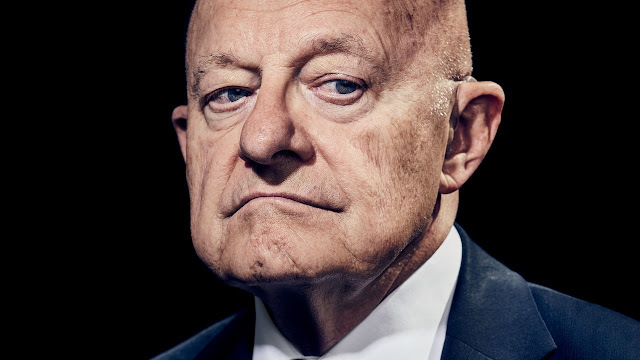 The source of that story appears to be James Clapper, Obama’s Director of National Intelligence — and now a CNN contributor. According to a House Intelligence Committee report released Friday, Clapper initially “flatly denied” discussing the dossier with CNN. But when confronted with evidence to the contrary, he changed his story. The report says “Clapper subsequently acknowledged discussing the ‘dossier with CNN journalist Jake Tapper,’ and admitted that he might have spoken with other journalists,” according to The Federalist. One more fact: Comey said he briefed Trump on the dossier at Clapper’s suggestion. That’s the deep state in action. President Trump, reacting to the report moments after its release, hailed its findings and said the Russia "Witch Hunt" must end, in an apparent swipe at Special Counsel Robert Mueller's ongoing investigation. “I am extremely disappointed with the overzealous redactions made by the IC. Many of the redactions include information that is publicly available, such as witness names and information previously declassified,” investigation leader Rep. Mike Conaway, R-Texas, complained in a statement Friday. 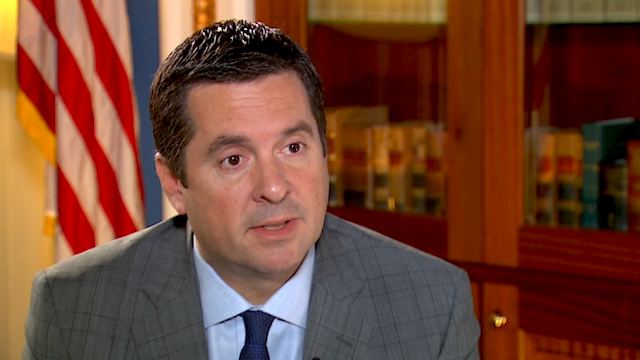 The committee’s investigation was based on four topics: Russian active measures against the 2016 U.S. election, the U.S. government’s response to the attack. Links between Russians and the Trump and Clinton campaigns, and purported leaks of classified information. The release of the full report comes after committee leaders announced key findings last month, prompting a war of words between Republican and Democratic members. The GOP majority at the time reported finding no evidence of collusion between Russia and Trump campaign associates. They also said that based on the investigation, the controversial anti-Trump dossier compiled by British ex-spy Christopher Steele “formed an essential part of an application” to the Foreign Intelligence Surveillance Court to obtain electronic surveillance on Trump adviser Carter Page. But the top committee Democrat blasted Republicans last month for “prematurely” shutting down the panel’s Russia probe and renewed their criticism on Friday. 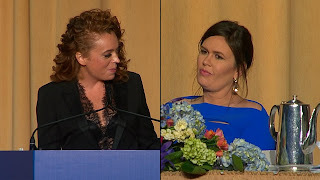 Comedian Michelle Wolf roasts Sarah Huckabee Sanders during the White House Correspondents’ Dinner. 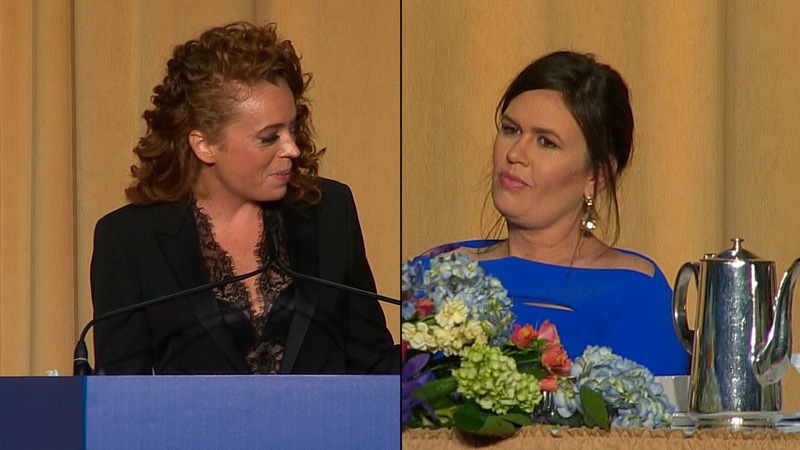 Wolf, a former “Daily Show” contributor takes jabs at everyone during her vulgar speech from politicians, to news networks and even the fish served for dinner but Sarah Sanders did a good job of sitting expressionless as she was mocked. CLICK HERE TO WATCH THE NASTY VIDEO. Seems kind of weird in this age of female empowerment in the face of misogyny that for 8 years, two white male press secretaries were completely off limits to comedians but it's now courage to go after the woman. 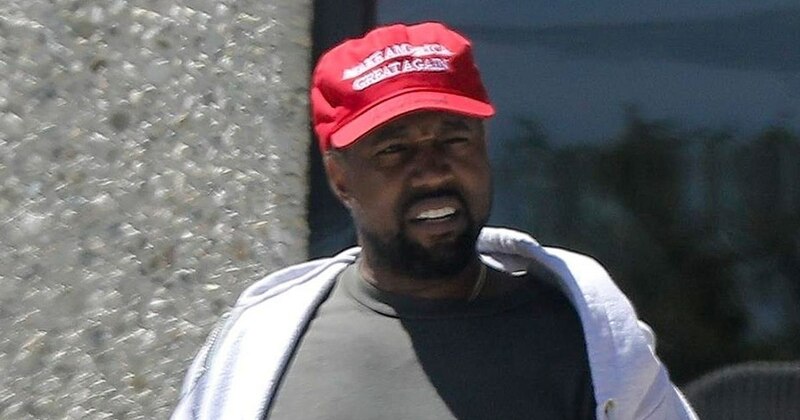 When Kanye West again declared himself a Trump supporter on Twitter, going so far as to publish a photo of his POTUS-autographed MAGA hat, literally millions of Americans immediately got the vapors. Either that or the Twitter gestapo got their revenge -- unless the sudden disappearance of huge numbers of the rapper's followers is merely an "inconsistency"? Many declared West had “gone off the deep end,” gone crazy, although the man was demonstrably more brilliant and more creative than 99.9% of his decriers. That these same people are the most slavish and pathetic conformists is the least of this. What these attacks on Kanye demonstrate in bold face is what has lurked beneath the surface for a long time -- liberals and progressives are the reactionaries of our time. It is also a further demonstration of a near complete lack of intellectual curiosity or emotional imagination, an inability to grasp the "remote" possibility that a highly intelligent black man could possibly think differently from them. Something must be wrong with him. Could anything possibly be wrong with them? Nah! When I was a young fellow traveler with the New Left (circa 1965), it was the worst accusation you could make. A reactionary was someone who was living in the past, taking us backwards, what the Trotskyites called the Stalinists -- and vice-versa. Back then, a group of people, Tom Hayden and others, anxious to breathe new life into a Marxist ideology seriously tarnished by Stalin's supposedly-accidental"excesses," promulgated, in the Port Huron Statement, a socialism "with a human face." It was propaganda, of course, aimed at themselves as much as others, but this Generation of 1968 product was remarkably successful, beyond their wildest dreams, I would guess. Over the decades and into today, they were able to infiltrate just about every aspect of our culture, creating an atmosphere where -- in nearly every aspect of our society -- nothing was good as is or even relatively satisfactory. Therefore, the fight must always go on. Perpetually. And at the heart of this fight -- as if to differentiate from the Stalinists -- was the idea of race. We were naturally imperialists and racists. We were born that way. That accusation would be primary, even though the Civil Rights Act was signed into law in 1964 and such discrimination made illegal. That meant things like the civil rights movement would always have to go on as they were because, in Marxist parlance, "the struggle continues." (La lucha continua, etc.) And on and on until this day. People like Maxine Waters and Al Sharpton now are no different from what they were then -- only richer. But they're still fighting, still tilting against racist and sexist windmills, even if they're not there. And if they are not there, then they will manufacture them, so they are able to fight them. And so, over the years, developing and evolving from them are now several generations of "mini-me's," spouting the same rhetoric, sometimes exactly, sometimes finding new variations of the same tunes, as Social Justice Warriors, etc. It's now the very air we breathe. So along into all this comes a dude like Kanye. He finds this vision stultifying and, dare I say it, boring. He thinks he's more than race. Imagine that. He must be crazy, although race may be -- of all things -- biologically meaningless. Scientists have long suspected that the racial categories recognized by society are not reflected on the genetic level. But the more closely that researchers examine the human genome -- the complement of genetic material encased in the heart of almost every cell of the body -- the more most of them are convinced that the standard labels used to distinguish people by ''race'' have little or no biological meaning. Somehow I think this would have pleased MLK. As I remember the civil rights movement from my own participation, we were all fighting for integration. Well, not all, but most of us. 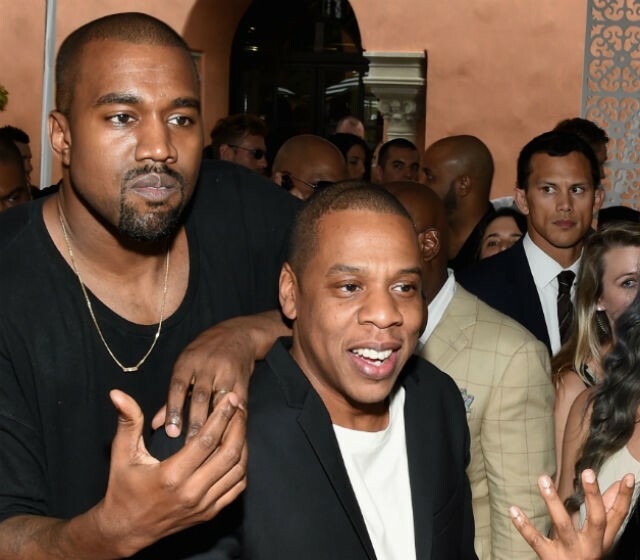 We were, like Kanye today, fighting for a world where race is irrelevant. Liberals and progressives of today seem to be doing the reverse. Not only are they reactionaries taking us backwards, they're segregationists. This is especially true on our college campuses, which have turned into nightmares of racial separatism. No wonder so many young people are in turmoil from Kanye's tweets. They can't stand his rationality -- and basic decency. In fact, they've barely been exposed to such a thing. What West's saying in his fashion makes simple common sense -- we are all individuals and should be judged accordingly. We should also have the freedom to act as individuals, not as slaves to some ideology or world view or, worst of all, somebody's idea of political correctness -- or finally as a black man, a yellow man, or any kind of color man. If Kanye West were to be in a mental hospital for his thoughts, the sane man would be inside the asylum and the crazy people without. I think I've heard that somewhere before. In a dramatic early Friday announcement, North and South Korean leaders agreed to a framework that could finally bring peace to the peninsula and potentially end decades of tension between the Hermit Kingdom and the global community. The joint announcement that both sides will work toward a "nuclear-free Korean Peninsula" and try to officially end the Korean War came after a historic meeting between South Korean President Moon Jae-in and North Korea’s Kim Jong Un -- who, fewer than four months ago, threatened the United States with nuclear weapons. But the same Kim Jong Un who declared in a stark New Year's address that a nuclear launch button is "always on my table" continued his recent -- and surprising -- push for peace during his meeting with Moon. While it was not immediately clear what concrete steps the countries would take to achieve the lofty goals set forth Friday, both nations agreed to hold further high-level talks and other negotiations, including a push for joint talks with the U.S. and also potentially China. 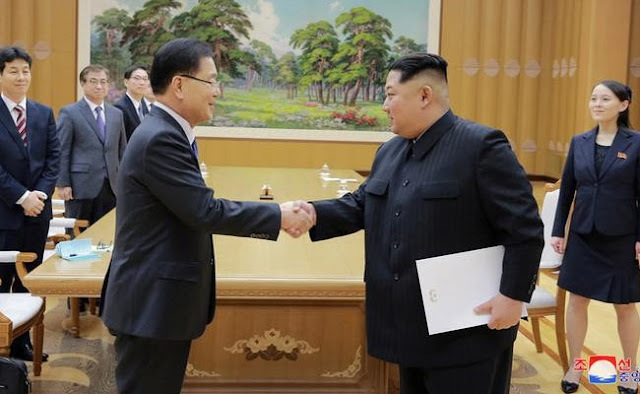 The Koreas, which have technically remained at war since the 1950-1953 Korean War was only stopped via an armistice, have agreed to stop all hostile acts over "land, sea and air" that can cause military tensions and clashes. The two leaders announced that starting May 1, all loudspeaker propaganda broadcasts that have been blaring at each other across their heavily-armed border will be suspended. They will also dismantle broadcasting equipment and stop flying propaganda leaflets across their border. Kim also promised Moon he "won't interrupt" his "early morning sleep anymore," a somewhat joking reference to North Korea's troubling intercontinental ballistic missile tests, South Korea said. It was the first time a member of the Kim dynasty was known to set foot on South Korean soil since 1953. The two men shook hands and smiled for news cameras. Kim and Moon planted a pine tree together as a symbol of peace before resuming their second meeting of the summit. They also unveiled a stone plaque placed next to the tree that was engraved with a message saying "Peace and Prosperity Are Planted." The summit has drawn measured responses from around the world. "After a furious year of missile launches and Nuclear testing, a historic meeting between North and South Korea is now taking place. Good things are happening, but only time will tell!" tweeted President Trump, whose own fiery rhetoric and aggressive posture are credited by some analysts with helping to bring North Korea to the bargaining table. British Foreign Secretary Boris Johnson said he welcomes the summit but doesn't expect any major breakthroughs. "I am very encouraged by what's happening," Johnson told reporters Friday. "I don't think that anybody looking at the history of North Korea's plans to develop a nuclear weapon would want to be over-optimistic at this point." China has welcomed the summit, saying it applauds the countries' leaders for taking a "historic step" toward peace.